1) Poor starving student Sandra Fluke needs $3000 to keep her from getting pregnant by a boyfriend who can afford to take her all over the world on exotic vacations but can't seem to cough up for the pills or rubber goods. Nice. Ha! A Bill O'Reilly viewer writes in that with all her political activism and world travels, it's a wonder Ms. Fluke (that's pronounced "fluck", she tells us) will become "Sandra Flunk". Heh. 2) The Arab Spring and the Religion of Pieces -- bringing back crucifixion and penal amputations just in time for Easter. Spent most of the day in and around the sites of the mission and martyrdom of St. Jean de Brébeuf and St. Gabriel Lalement, near Midland, Ontario. A beautiful day, with sunshine and cool breeze amid melting remnants of snow at the foot of bare birches, next to a small but noisy river, as the ice was breaking up on nearby lakes and ponds and inlets -- just one day before the 363rd anniversary of that day of terror, torture, and murder, March 16, 1649. 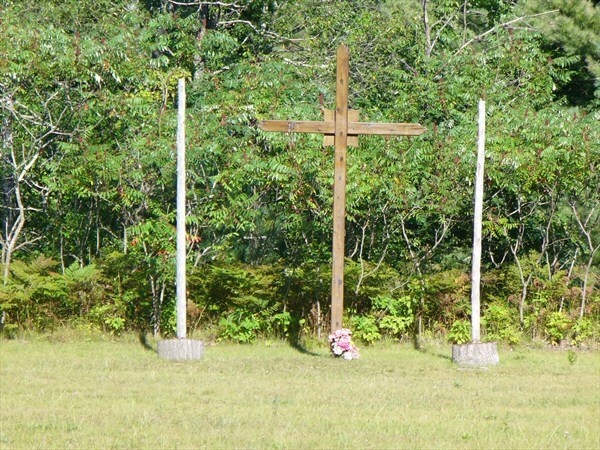 We were a small group of pilgrims, mostly kids and seminarians, praying the Mass on the holy ground of St. Ignace, just a stone's throw from the wooden cross and the two upright tree trunks which stand on the site of the stakes that held up the clubbed, slashed, gouged, broiled and branded bodies of the two Jesuit missionaries. It wasn't hard to picture who to pray for at the foot of those stakes -- those who suffer in all too similar a way to this very day: the Chaldeans, Coptics, Christians from Syria, Lebanon, Israel, Iraq, Egypt all hounded, battered, and blown from the homes they've held for two thousand years in the cradle of Christendom; the innocents blown apart from Jerusalem to Gaza to Kandahar to Nigeria to Bali; the women [scroll down] burned, beaten, dissolved, stoned, and clitorectomied in the name of patriarchy; Menchaca and Tucker, and Danny Pearl mutilated and beheaded by Al Qaeda. It's still hell on wheels at full speed out there, and it still tears into the flesh and makes rivers of blood. Christianity is still hard, and defending the right, and just getting by day to day in turbulent corners of the world, whatever one's faith or culture. And prayer still helps, even when you're not standing at the foot of the stakes where the ground has been seeded with the blood of martyrs. At least I'd like to think so. Some days it's hard. Posted by Winefred at 11:05 p.m.